When Geeta's abusive husband left her, she went from fear to despair—not relief. "My husband left me alone," she remembers. "He went somewhere. I don't know where he went. After he left, I thought to myself, 'Where will I go? Where will I stay?' "
Geeta didn't know what to do. All she knew was that she couldn't let her children or herself starve. So she found a good-paying job as a waitress in a hotel, earning 100 rupees (less than $2) every day. It was enough to rent a tiny room in the slums where she and her children could live. The extravagant amount of income drew suspicion from her relatives, and they began accusing her of working as a prostitute. Geeta was upset, but she eventually found herself succumbing to their false perceptions. Next thing she knew, she was working on the streets. Geeta's children are thriving in Bridge of Hope. And as this little family attends worship services and prays together every morning they are all growing in their faith. "They were thinking I was a prostitute, so I started to work as one," Geeta explains. But one of her friends, a believer in Jesus, knew there was a better way to live. Along with loving counsel, Geeta's friend gave her a pamphlet that shared how Jesus could be her Savior and Protector. It was what Geeta had been searching for, and she embraced the love of Christ. She chose to give up her destructive lifestyle and found a job at a jewelry factory. She also started going to a Gospel for Asia-supported church with her friend and began growing in her faith. A love for Jesus began to take over her life. "I found myself walking a very different path," Geeta shares, "in a peaceful atmosphere." Slum life can be devastating, especially for children. Gospel for Asia-supported missionary Martin, who pastors the church Geeta attends, can testify to that. He grew up in the slums and recalls how difficult it was being left to fend for himself in a harsh world. "The children abuse each other with filthy words," Pastor Martin says. "I have experienced what slum life is like, what it is to be poor and struggling for food." Geeta's children were no better off, Martin remembers. "Her children were living just like slumdogs," he says. "They never bathed. They lived in a dirty place. They never found good food to eat." + Most children living in the slums drop out of school by 7th grade. They end up as child laborers or street beggars. + Most women in the slums are widows or abandoned by their husbands. 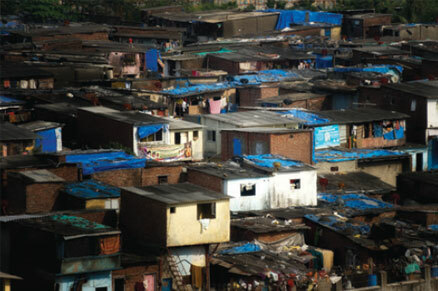 + Because of unhygienic conditions, many slum dwellers contract deadly illnesses such as tuberculosis and HIV. And they were suffering in other ways, too. Geeta remembers how they rarely obeyed her and wouldn't show her respect. And because she had to leave them alone for long periods of the day while she went to work, Geeta worried for her daughter and son's safety in the coarse environment of the slum. Pastor Martin asked the nearby Bridge of Hope staff to give any leftover food to Geeta's children to fill their empty stomachs. When Geeta found out how Bridge of Hope was taking care of her children, she enrolled them in the center. As the weeks passed, Geeta started to see a transformation in her children's lives. They began to respect her. They taught her how to pray and memorize Bible verses. Bridge of Hope helped solidify new life for Geeta and her family. Together, they grew in their faith and walked out of darkness and into the light. 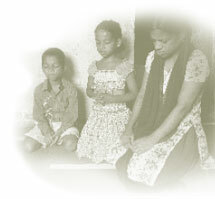 But as Geeta's relationship with the Lord deepened, the troubles in her life seemed to intensify. Her boss began to demand that she fulfill his physical desires, and being her landlord as well, he threatened to kick her out of her home if she didn't comply. At one point Geeta thought she would give in if it would free her of her troubles. But as she started to read the Bible and saw how her children were praying, she too started to pray, and the Lord gave her the courage to resist temptations. "The Holy Spirit said in my heart that it's very wrong, entirely against God," Geeta shares. "So I cannot do that." Because of the Holy Spirit, today, I stand firm. Miraculously, Geeta's situation with her boss turned completely around. He stopped harassing her, and she now enjoys working at her job. "I don't know what happened, but the situation changed," Geeta explains. Today, Geeta and her children have found another place to live in the slums. Their new home is still small—about the size of a walk-in closet—but it's located in a safer neighborhood. Pastor Martin and the members of his church continue to minister to Geeta's little family, offering help and encouragement when needed. She and her children faithfully attend church, and Geeta helps lead the Women's Fellowship group that meets there. As she looks toward the future, Geeta is not interested in material blessings; she is satisfied with the Lord's provision for her. Her prayer for her children as they grow up is that they would live as servants of God, blessing others with the love they have freely received in Christ. "I want my son to be a man of God," Geeta shares. "I want to see my children sharing God's Word. I want to see them laying their hands on the poor and praying for them. I want to see them become a great channel of blessing for others." Even though she still faces the daily struggles and challenges of slum life, Geeta rejoices knowing she and her children rest in the protective hands of the Almighty. "I give thanks to the Lord because God is changing our life day by day," Geeta says. "He's taking care of my children and me." By donating to the Widows and Abandoned Children fund, you ensure those like Geeta and her family are taken care of and shown love.